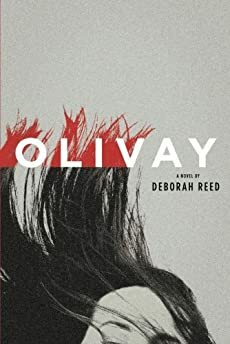 Largehearted Boy: Book Notes - Deborah Reed "Olivay"
Book Notes - Deborah Reed "Olivay"
Deborah Reed's Olivay is an unsettling and compelling literary thriller. The idea for my novel, Olivay, began during the Boston Marathon bombing when a man who thought he was having a one night stand with a woman wound up being stuck in her apartment while the city went on lockdown. He started live-tweeting this situation from the woman’s apartment, and I believe these tweets were picked up by the Huffington Post, which is where I first read about it. Long after the lockdown was over, I couldn’t stop imagining two strangers, meant to be lovers for only one night, forced to remain in each other’s company while a terrorist was on the loose and the city under siege. I thought about who they were, what kind of pasts they were bringing into that closed space. In an already precarious situation, I knew they would have to be fractured and frail souls, each in their own way, and beautiful too, given the chance. So I tried to give the people who became Olivay and Henry, a chance—each deserving of the other, each with terrible secrets they didn’t want to reveal. Like the line from the poem by Juan Felipe Herrera, “I want to write about love in the face of disaster,” I began thinking about terror and terrorism in all its forms—World Wars, the Holocaust, terrorist attacks, homicide, the endless ways human beings inflict pain on one another, all the way down to the 24 hour news cycle accosting the senses with its constant pin pricks of bad news, and finally to the tiny terrors two people in a relationship inflict on one another. I wondered about the place where we find one another in harmony, how we ever manage to get there, what a miracle it seems to be, given all the terror, to offer another person grace and peace. I wondered what would happen if Olivay began to fall in love with Henry at the same rate she suspected he had something to do with the terrorist attack. I wondered if he were actually capable of doing that kind of harm, and if so, what had brought him to that point? It took me less than a year to write the manuscript. Another song favored by Olivay and Will, and when it appears in the novel she is listening to it for the first time since his death, finding inspiration instead of pain. “She [Olivay] had forgotten that music hadn’t always stirred a gloomy, forlorn ache in her chest.” This is the morning after she has slept with Henry and she begins to wake up to the possibility of a new life. She’s an architect who hasn’t worked in a year, but it is while this song is playing that she begins to sketch again, imagining a room spilling with light—“Someday when the world is much brighter,” Richie Havens sings. Singer/songwriter Sam Baker was himself a victim of a terrorist attack in Peru in 1986. The song, "Broken Fingers," is so achingly beautiful; a tribute to the young boy who was sitting across from him when the bomb went off on the luggage rack above their heads. The boy and his parents died in the blast. Sam Baker survived but his recovery was long and painful and the fingers on his right hand are permanently twisted. He plays guitar nonetheless, with his left. Like Olivay in my novel, Sam Baker was forever changed by violence and cruelty, and yet hope is never too far away, hovering right there along the edges. I didn’t realize until after I had finished the novel that I was listening to several different songs on repeat that included something about breathing. It can’t be a coincidence since a good part of the novel plays out in the smoky haze of a bomb explosion on the west side of Los Angeles, and fires set in the dry canyons on the east. Of course there is also Olivay trying to catch her breath, as well, from the rush of so many feelings overcoming her during the three-day lockdown with Henry. The claustrophobic feel of breathlessness runs throughout Olivay. A haunting melody I could listen to on repeat for all of eternity. It so perfectly contains the nuance and pain of Olivay. The first word in the song is “help”, followed by, “be my friend, hold me, wrap me up, unfold me, I am small, and needy, warm me up, and breathe me. Ouch. I have lost myself again.” I mean it hurts me just to lay those lines down here. Olivay confesses to Henry within minutes of meeting him that she never “wants to feel helpless again.” Of course, for the better part of the novel she will be rendered nearly powerless. It was excruciating to write those scenes. This song is about having a life-threatening asthma attack while gardening. The woman’s breath is lost and an ambulance is called, and in the midst of keeping the life in her, she is keenly aware of the person saving her, which is also what is happening to Olivay as Henry makes sure she is all right after the bomb explosion blows her windows out and her body is full of glass shards and debris, her knee deeply in need of stitches. And then the lyric, “Should’ve stayed in bed today, I much prefer the mundane.” There is a line in Olivay about people leading mundane lives, and to top it off Olivay has spent the better part of six months in her bed after Will’s death. “My hands are shaky. My knees are weak. I can’t seem to stand. On my own two feet,” Courtney Barnett sings, and this is exactly what happens to Olivay in the blast, literally and figuratively. Her leg is injured so badly that she can barely stand, hands shaking from the shock. She begins to lose her emotional grip over time as well, making it harder to stand on her metaphorical two feet, too. Another example of the subconscious at work? Has to be. Both the title of the song and the name of the band. Olivay and Henry are thrown together for three days in her small apartment with no real escape, which makes for a crowded house, while the tensions, both sexual and life-threatening, grow stronger and stronger. Well, now it just sounds like I’m making this up. First Aid Kit? True, though. I listened to this song constantly while writing Olivay. I think those lyrics speak for themselves. Olivay and Henry recognize one another’s worth in spite of what they see outwardly and obviously in one another, but it is especially Olivay who is taking a chance here as it looks more and more like Henry had something to do with the terrorist attack. It is she who must look past a crime beyond comprehension and into the core of Henry’s soul toward something of forgiveness. These chapters were the most difficult to write, posing the question of whether redemption in the face of atrocity is ever a true possibility. And when Olivay begins to take matters into her own hands Henry must also decide who Olivay truly is beyond her actions as the novel takes an even darker turn. By the novel’s end the ultimate question becomes who is worthy of love? Who is worthy of grace and absolution? All of us? None of us? Only a chosen few? The story circles back to all the ways human beings terrorize each other, and questions if or how one can ever truly find the sweet spot of love and light with another human being before it’s too late.